Well, Bacon Jam… thats different! We love bacon! Skillet Street Food has done all the prep work for you. Skillet Street Food uses niman ranch bacon and render it down along with onions, balsamic and other spices. It cooks for several hours until it is a perfect blend of smoky, tangy, savory and slightly sweet. 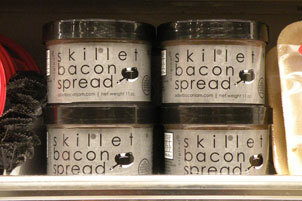 Bacon goodness all wrapped up in a spreadable. We had it on sandwiches and also added it to mashed potatoes. Mmmmmm, the flavor is fresh and savory! Just check out their website Skillet Street Food! or email them at eat@skilletstreetfood.com. Thank you for sharing, interesting.